This was the first tournament for Dom Hamilton since officially taking the England Number 1 spot at the start of this month. Despite having a tough group with Adam Grilli and Jason Walsh, both in form, he looked in complete control coming through without dropping a single game. A real battle for 2nd place though, Walsh is arguably Derbyshire’s leading racketballer but was just piped to the post by Grilli who looked solid throughout the group stage. The day started out badly for the local hero Pete Goodings losing first round to series veteran Mark Webster 2-0 but Goodings found a way back with victory over Dan Lawrence (Who still looked like he was in the car coming down from Sheffield). Group B was always going to be close and with only 1 point separating the 3 players it couldn’t have been a tighter finish. As the old saying goes it’s better to be lucky than good but Goodings will probably need both if he is to come through the semi against Group A winner Hamilton. Galen reached the final of the last UK-Racketball event of last season in Hunts country and his campaign to take the Manor crown started well will comfortable wins over Neil Rossin and Nick Burton in the group stage. One of the toughest groups of the day with both Ben Brown and Tom Phipps fancying their chances of getting through and both potentially having a good shout for the Manor Racketball Open crown. In the end Phipps overcame his higher ranked competitor and came through as group D winner to face Galen in the Semi. Brown picked up an injury in the battle with Phipps forcing him to retire, while Rushby will now join his Sheffield team mates to play off for 11th, 12th and 13th place. A fantastic match was won by Grilli against Rossin, both players gave it everything with numerous match balls being lost before Grilli eventually hung on to victory. It might have taken too much out of him and a motivated Dan Lawrence took full advantage to stake his claim to 5th place, a shame he lost to Goodings so early as the form at the end should suggest he could have made life difficult for anyone in the Semi’s. On the show court and with the crowd firmly behind him Goodings did his best to contain Hamilton’s attacks and aggressive movement onto the ball, but to no avail. With Hamilton looking comfortable in the end with a 2-0 victory. Goodings definitely had his moments ripping some fantastic balls into the nick and was heard afterwards to say “give me a couple more months and I will be there”, just in time for Lincoln then Pete! Great match between two UK-Racketball finalists last year. Galen controlled the ball really well and made Phipps do a lot of work and into the 2nd game this began to take its toll with Phipps making progressively more errors. It was a great semi between two of the country’s best racketball players who will both be close to an England Top 10 spot when next month’s rankings are confirmed on May 1st. Going to be a tough finish for Galen though who will be back on against Hamilton in just over an hour. Fantastic start with Galen controlling the play and freely going for winners (The video is up on YouTube and shown below, the 3rd rally in the 1st game is a must watch as Galen was brilliant! Unfortunately someone managed to get their head in the way of the camera for the entire match, Curtis?!). Mid way through the 6th point Galen even finds time to have a chat with the marker over a decision and then just caries on playing. From 4-2 in the first however Galen visibly starts to tire and slow, Hamilton steps up the pace, it seemed that unless Galen was in complete control of a rally it was hard for him to find a way back. Whereas Hamilton almost seemed to feed off the work Galen was forcing him to do. 11/6 Hamilton. The second was an exhibition from Galen, going for all the shots but with few of them coming off. The game became quite bitty with both players trading off points, but Hamilton always in the lead. Although Galen fought all the way in the end Hamilton was just too quick, he looked by far the fresher of the two which must have helped considerably. He looked at times to be travelling twice as fast. A Le Cheminant match wouldn’t be complete without some fantastic shots but on the day Hamilton had all the answers. In the end Hamilton took the game 11/6 and with it the match 2-0 and a fourth UK-Racketball Series Title to add to the collection. This match is now on YouTube and is available by clicking here. I am sorry about the head but the racketball at the start of the 1st game is just too good to be left off!! It was tough in Group A for number 1 seed James Murphy coming up against local club coach and unknown racketball player Curtis Thomlinson. It was a tough match but in the end youth overcame experience and in his first UK-Racketball event Thomlinson progressed through to the Semi Finals. The second group in grade B could not have been closer with only 1 point separating Anthony Horsley and James Healey. A great match between Heron and Tatham decided the group with both players fighting right to the end. This was one of the hardest B grades we have had yet, which is illustrated by the fact that Heron who was in contention at both Wolverhampton and Hunts County was beaten 2-0 in the group stage. Group D was won by Paul Whiby who didn’t drop a single game. It was a tough opening group stage for the UK-Racketball Series veterans with James Murphy, Stephen Elliott, David Heron and Gary Slator all coming close but in the end failing to progress through to the semi final stages. A nervous start from Tomlinson gave Tatham an early 2-0 lead and it was only due to a fortunate let that it wasn’t worse. Tomlinson eventually found a rhythm however and managed to exert his authority on the match moving Tatham to all 4 corners with his tight straight drops taking him to a 9-5 lead. Towards the end Tatham went for a few shots and almost found a way back at 7-9 but in the end the 1st game went to Tomlinson 11/7. The second started badly for Tomlinson who was going short too early and made a series of unforced errors which gifted a 6-2 lead to Tatham. It wasn’t enough though and as the pace was raised it was Tomlinson who came through victorious much to the disappointment of the partisan crowd who may have already had a couple of beers! This was the first ever women’s event at a UK-Racketball Series event and it was a massive success with 10 competitors making up the 3 groups. Group A was won by Matilda Parslow the number 1 seed who came 2nd in the North East Regional Championships last month. Only 1 point separated 2nd place with Emma Binns coming out on top against Gill Taylor 2-1 in a great match. In Group B Joanne Bowman came out on top with 4 points and Anna Brown defeated Teri Mottram in a fantastic match with the Chapel A and Manor supporters making themselves heard throughout. Anna was 1-0 up and even had match balls in the 2nd before Teri fought back taking the game and setting up the decider. Group C was very close with none of the group winners dropping a single game in the run-up to the final group it was always going to be a close finish and in the end it couldn’t have been closer with the final match being won by Matilda 15/13 in the 3rd. Her opponent Jayne Dixon coming back from a game down to first level the tie at 1-1 before again in the 3rd Marilda took an early lead before looking progressively more nervous towards the end of the game and allowing Dixon back in. It was a fantastic end to the tournament and the closest UK-Racketball final so far with both players having a couple of chances to finish the match but both players making mistakes just when they had the chance to wrap things up. In the end it was Matilda who finally held her nerve first and on her 3rd match ball clinched her 1st UK-Racketball title and top of the range Harrow Racket prise. Number 1 seed and England Number 5 Mark Francis had to fight through the group stage with only 1 point separating him from Huddersfield’s Neil Baldwin. Group B was just as close with Todd Mcquilkin and Ian Furlonger battling right to the end in the deciding group match before Furlonger, to the dismay of the loyal Manor crowd, took the match 2-1. With nothing to separate the 2 players who finished 2nd this set up a 1 game playoff between Baldwin and Mcquilkin for a place in the winners group. This was the first time that a group had ever come down to a heroic 1 game duel for a place in the final and it didn’t disappoint setting up a classic encounter of grit and determination, before Mcquilkin’s recent dodgy knee flared up and forced his early retirement. The over 40’s was eventually won by Baldwin which should give him enough points to make it into the England Top 10 National Rankings in May. Once again the over 50’s was the largest draw of the day and without the 5 times winner from the 2010 Series Mike Philips the draw was wide open. James Murphy, Garry Devonish, and Geoff Clay all made it through their groups without dropping any games, while Graham Greensall had to fight hard to overcome Paul Oldham to set up 2 very competitive Semi finals. In the first Semi number 1 seed James Murphy overcame Garry Devonish to make his 4th UK-Racketball final, while Graham Greensall was pushed to the limit for the 2nd time in the day by Geoff Clay. a bitty start with neither player exerting control on the game to get ahead. Murphy was always looking for the volley right from the start but failed to go short effectively. At 5-8 Murphy felt that he had got a bad decision and decided to up the pace to try and get back into the match, which worked against him and he soon found himself 10-7 down and having to save 3 game balls to stay in the game. Up until now Greensall had played almost error free racketball but it was at this point that the errors started to creep in and this was all Murphy needed to find a way back in and steel the game 12/10. The 2nd was close all the way with both players looking tired from the 4 matches they had already played. At 7-7 though Murphy managed, through effective volleying and positioning to get Greensall on the end of a couple of brutal rallies which finished him off, 11/7 Murphy and with it his first UK-Racketball Series Title! During the break from the last series we talked over how we could keep encouraging beginners to take up the game and become involved with our series and decided that if we introduced a beginner’s grade to our events this would attract players just starting out and give them something to aim for. It would also be a great bridge towards the B grade which will hopefully grow the interest in the series for the future. Group A was won by John Bireley with the match of the day between Stewart Lowth and Liam Truswell deciding 2nd place. In the end it was Lowth who came through victorious despite the crowd being behind the local “cook” Truswell right from the start. Group B was close all the way with John Nokes running Tom Yates close before losing to Daniel Mcquilkin. The Semi’s were close with Mcquilkin running Bireley close and Lowth losing to Yates. Mcquilkin finished off with a victory over Lowth in the 3rd/ 4th playoff, but Lowth won’t be too disappointed, 2 events last year and yet to clock up a victory and then 2 on the same day! In the Final local Bierley came through the victor and claimed the first honours of the day for the local club. It was a fantastic event for our first ever beginners category and as 2 of the players have already entered some of the later events in the series hopefully that means they liked it. Located in the heart of Derbyshire, one of the first counties to start an inter-club racketball league, The Manor is already cementing itself as one of the leading racketball centres in the country. UK-Racketball is really pleased to welcome such a strong centre to the series and for it to take over from Nottingham as the first event in the Harrow Series for 2011. It has recently converted part of its gym back into squash courts to help cope with the growing popularity of the short racket which was announced at an exhibition between our two National Champions Laura Hill and Daryl Selby. Anyone who saw the match won’t forget it, Laura won! Pete Goodings has been appointed the clubs new racket manager and I am sure with his dedication and enthusiasm the club will go from strength to strength. The club is easy to reach just of the M1 and will be a fantastic warm up to the national championships which will be taking place 3 weeks later. As always we will be sure to see a massive range of standard at the event but get ready for a lot of racketball and some fantastic finals! All entries are guaranteed a Harrow 2011 UK-Racketball Tour t-shirt. As the tournament is played all in one day we are planning for about a 9:30am start (although this could be later depending on entries and will be confirmed closer to the date) the finals will be around 6:00pm in the evening. We guarantee every competitor will have at least 3 matches with the format will be either group stages through to knockout, monrad or straight knockout, depending on numbers of entries. We will always ensure that every competitor has at least three, best of three, matches. Scoring will be American to 11 and best of 3 games. The tournament is sanctioned by England Squash and Racketball and has a grade 1.5 status. New to 2011 the beginners category, just started playing, fancy a tournament, play against people of a similar standard for our new discount rate of £10.00. Top Ranking points for the English National Racketball Ranking List. And earn points towards your UK-Racketball series rankings (see how they work here). 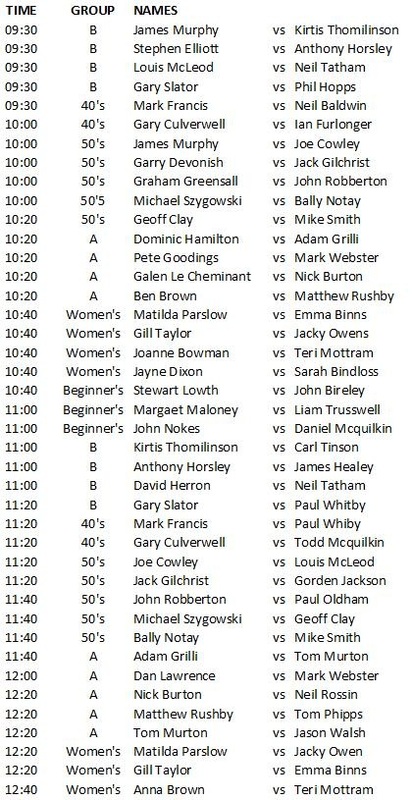 6 separate categories to choose from Men’s A, Men’s B, Women’s, Over 40s, Over 50s, Beginners. We hope that you enjoy our first tournament of The 2011 Harrow UK-Racketball Series, for pictures of the club and its location please see below. Club FacilitiesThe Manor Club was built in 1980, the intention then was to create one of the best clubs in the UK. Today the intention remains the same. The club has recently completed an extensive refurbishment project with over £300,000 having been spent on improving facilities with every court getting a much needed facelift with brand new floors and walls. The Manor has 5 courts with 3 championship glass back courts that have all recently been refurbished. The club is great for both squash and racketball and has teams in the Nottinghamshire and Derbyshire leagues.